Our qayaq's heritage is from Utqiagviq, Alaska, but it still looks at home along the shores of the Yukon River. We built alongside three other master boatbuilders of Canadian indigenous cultures for Voices Across the Water, and launched during the Adáka festival on July 7th. When I first began building qayaqs twenty years ago, Wayne Price was involved with the boatbuilding project called Qayaqs and Canoes in Alaska. I remember watching that video decades ago and wanting to become a master boatbuilder. Today, his dugouts have journeyed thousands of miles and brought communities together. Our Iñupiaq qayaq frame was lashed together with caribou sinew. The sinew, or leg tendon, is separated into footlong lengths and twisted together to make 30 meter thin strong lashing cord. 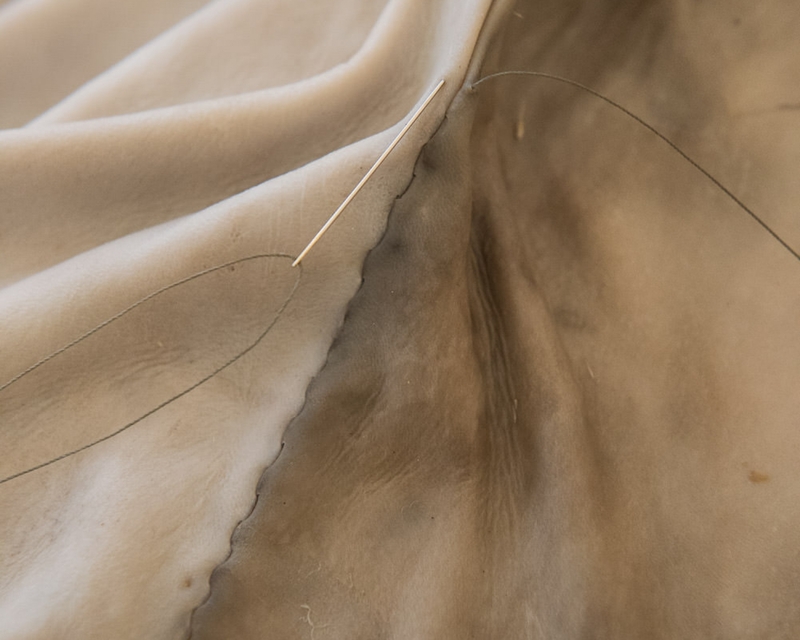 I soaked these harp seal skins in the Yukon river to slowly ferment them so the hair would slip in preparation for covering the qayaq frame with them. This is different than traditional Iñuit technique, but the climate in Whitehorse is much warmer. After sewing together six caribou hides into a single sheet, we laid them out to see how much final coverage we had. Building next to Wayne Price's dugout Jibbe, I could feel the kinship of cultures. Addie Asbridge sews caribou hides together using a traditional double waterproof stitch. This painstaking technique requires one to stitch only partway through a hide, never creating needle holes. It took 4 people 3 days to stitch the hides together, but the waterproof stitch was truly waterproof once the qayaq was done. This waterproof stitch is tough to do but completely watertight-- it is stitched on both sides of the hides and the needle never penetrates. 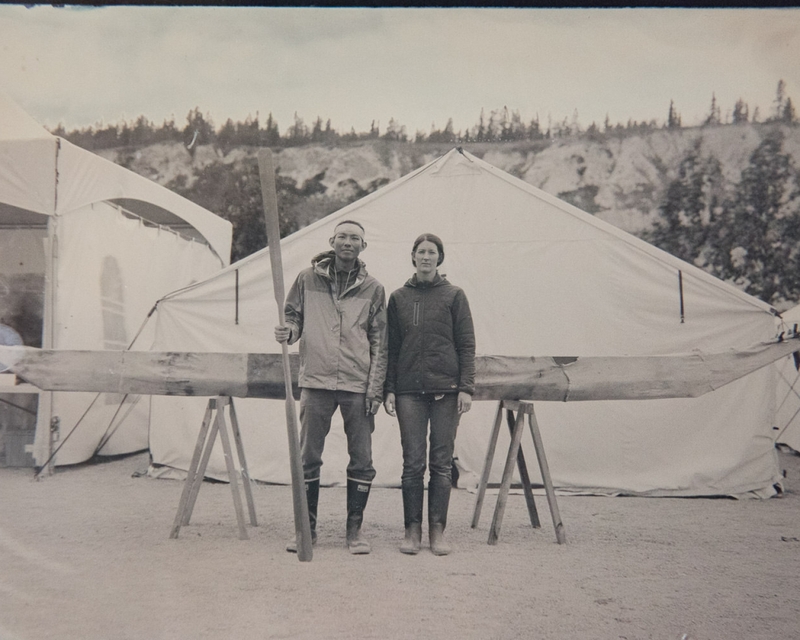 Photographer Peta Matsumoto took a photo of Addie and I and our partially completed qayaq using an old photographic technique called tintype. We found it to be beautiful, and coincidentally, not unlike the well known painting, American Gothic. Testing our waterproof seams-- a success! The waterproof traditional qayaq stitch worked very well although we did take on some water at this stage through a multitude of warble fly holes in the caribou hides. Warbles are parasites that burrow into caribou skin and create breathing holes, which heal but are present during most seasons. Ashley Rose, an Iñuit from Nunvaut, sews the deck of the qayaq. She was excited to be working on it, as qayaqs have been gone from Nunavat and nearly all of the Arctic for sixty years. She is of a generation of indigenous youth that are reclaiming tradition all over the world. Trimming the qayaq coaming with an ulu made by John Hefle of Utqiagviq. 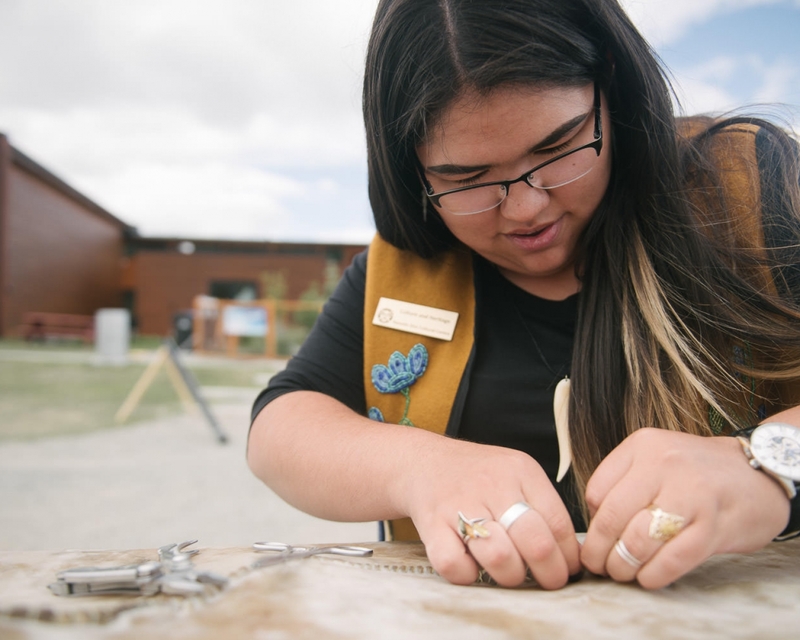 Though as native peoples we have adapted a lot of modern tools for traditional craft, we retain many original tools that suit the purpose better. A view inside the hull of our Iñupiaq qayaq, showing the caribou hide seat pad I use when I paddle. Experienced qayaq builders can see that I adapted some techniques from Greenland to achieve the shape I wanted. Doug Smarch Jr, the Tlingit builder of the moose hide boat, grew up cutting hide babiche (line). He taught me how to cut some his way, using just a knife and two people. It worked really well, though the sealskin was quite slippery to hold onto. Our first look at the finished qayaq just before testing, Addie laid down to give the photo a sense of the scale of the qayaq. Addie Asbridge does a bow rudder and flips the qayaq around quickly as she glides over the clear waters of Schwatka Lake. The qayaq performed just as we expected it to, and took on very little water through its waterproof seams. Although Northern Iñupiaq qayaqs were never rolled in the past, I rolled this one. I don't build replicas of historic qayaqs-- as a modern indigenous builder I am more interested in making qayaqs safer and more suitable for the things we do with them now. One of the reasons qayaqs fell out of use around the Arctic is because many people died when hunting from them. Today I have kept the basic forms that make each culture's qayaqs unique, but adapted the hull shapes so that our youth can use them safely for practical purposes. Justin Smith raises an oar in greeting as he cruises past in Peacemaker, the 22' Tlingit dugout he helped bring to life. It was a confluence of cultures. My friend Ken Anderson carved one of my culture's protection spirits, which normally guards the home. I thought it would make a great protection spirit for all the watercraft on our first voyage. This portrait of myself, Addie Asbridge and Ashley Rose, the principal builders of the qayaq, highlights how the building of a qayaq is all about community. David Gendron paddles the Tutchone Birch Bark Canoe down the Yukon on its first voyage. It proved to be a fast and beautiful craft going down the river. Doug Smarch Jr and John Peters test their moosehide boat, the first to be made in over 60 years. "It was only stories that we heard, a younger generation that only used to hear stories from our parents, and now it's sitting there and we're going to jump in this thing and paddle it. We're going to create our stories," says Smarch. “Nobody has seen a moosehide boat in sixty years. I have never seen a birch bark canoe in my life. I have never seen a qayaq. And I have never seen a dugout canoe being built. Now they are here in front of us.” – Inland Tlingit elder Douglas Smarch, Sr. I am breezing down the swift Yukon river, the sky blue and the river teal, as the chanting and clatter of paddles gets louder and more rhythmic with military precision. As my kayak glides up behind a long trailing line of bright red feathers, I can feel the Maori beating their paddles on their waka, their dugout canoe. Behind me, an enormous bright red dugout, 27’ long, cruises up proudly, with silver-haired Tlingit Wayne Price at the stern wielding his steering paddle. He is beaming, the sun is beaming, and I am beaming. We are making history. Maybe it’s not the sun beaming. It’s our ancestors smiling down on us. 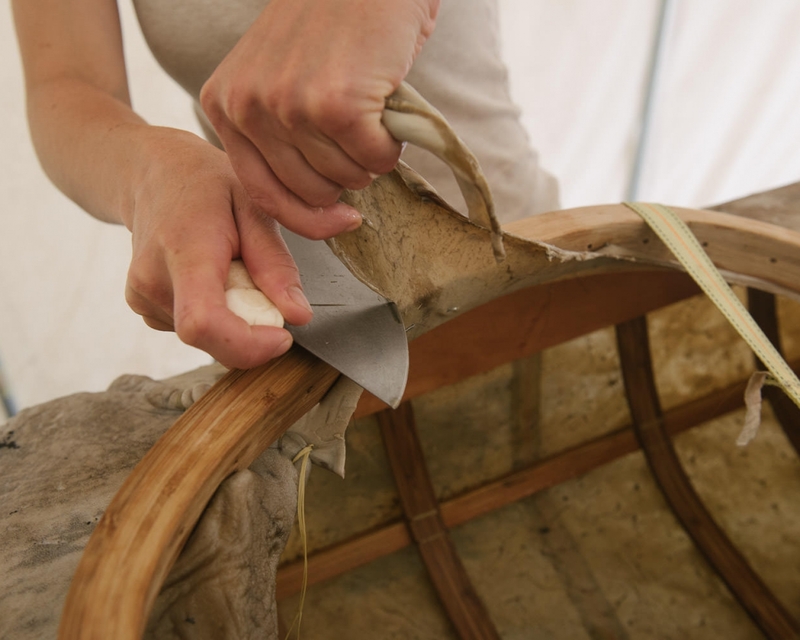 Three months earlier, I had gotten a call, an invitation to Whitehorse to build a sealskin qayaq (kayak) for a historic boatbuilding project, Voices Across the Water. 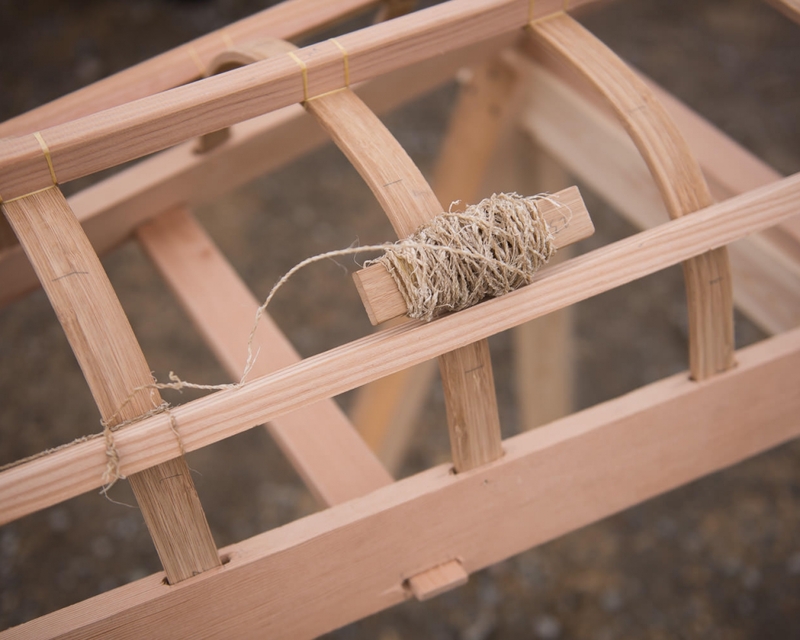 Alongside three other master boatbuilders, we would build 4 rare indigenous watercraft. We would animate a huge Tlingit dugout canoe carved from a single spruce, a Tlingit moosehide boat, a Tutchone bark canoe wrapped in a single piece of birch bark, and a 16’ Iñupiaq qayaq covered by the hides of caribou and seals. I spent a month, along with my partner Addie, working on the qayaq, mostly on sewing the skins. Knowledge of skin sewing has almost vanished across the North. When I began building qayaqs twenty years ago, it seemed that noone was left who had direct experience with qayaq building. Fortunately, I’ve been able to learn to sew the skins again thanks to Patricia Sage and the other women up in Utqiagviq who still sew the skins of umiaqs, the big brothers of qayaqs. We ran into a lot of setbacks with the hides– the wrong species of seal arrived, our elder with the lifetime of sealskin sewing never made it, and our substitute caribou hides were filled with warble fly holes. Nonetheless, in the spirit of our ancestors, and thanks to the hard work of Charlene Alexander, Anne Mease and Steve Cooper, we made it work. All the other builders had setbacks as well, but the community came together and it worked! On July 6th, during the Adáka Festival, we launched all the watercraft together for a voyage down the Yukon. Thank you for the very nice article. So beautiful! ! Thank you for sharing and for all your great energy, spirit and teachings. Love you Kiliii and Addie – so honored you were both able to come and do the project. This project has shown that cultural values and traditional pursuit is still very much alive if only by a few! Many now will transfer your knowledge into their ways of knowing!